Support vector machines represent a state-of-the-art paradigm, which has nevertheless been tackled by a number of other approaches in view of the development of a superior hybridized technique. 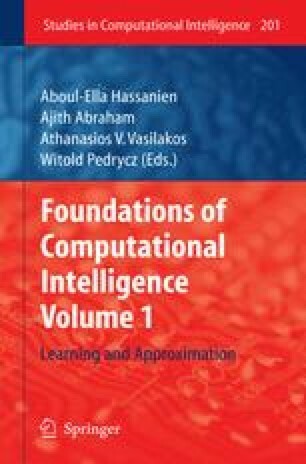 It is also the proposal of present chapter to bring support vector machines together with evolutionary computation, with the aim to offer a simplified solving version for the central optimization problem of determining the equation of the hyperplane deriving from support vector learning. The evolutionary approach suggested in this chapter resolves the complexity of the optimizer, opens the ‘blackbox’ of support vector training and breaks the limits of the canonical solving component.